Our republic was framed with power separated between distinct and equal branches of government. Defined limits to the authority of each ensured that autonomy, jealously guarded, would restrain the ambitious from consolidating all the powers from the people and the states into the control of an elite minority. To combine the power to legislate with the power to enforce or the power to interpret and judge would overturn the wisely crafted framework laid down in the Declaration and built upon by the Constitution. The sovereignty of a self-governing people would, through elected representatives, enact laws that disclose the existence of certain rules for the healthy growth and productive advance of the nation. It was exercised by civilized countries for centuries until the right of nations to set standards for citizenship became illegitimate in recent decades. Instead of respecting law and responsible citizenship, borders are decried as “xenophobic” and naturalization “oppressive” to what the current Attorney General considers the “civil right” of illegal immigration. Emotion, too often, counters the need for careful deliberation of our laws to preempt bad policies. Immigration and basic standards of citizenship are no exception. We are experiencing now the effects of a nation in denial of itself, its laws and its institutions. A nation that renounces standards for admittance is not a nation at all, but has become an amorphous tract of territory that owes all to everyone regardless of character, conduct or intentions without anything required in return. This is a recipe for very real chaos. 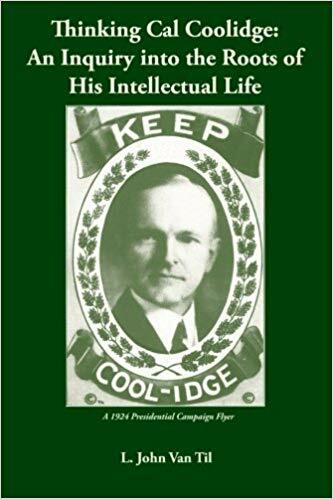 President Coolidge defended the motives of immigration standards when he said, “Restricted immigration is not an offensive but purely a defensive action. It is not adopted in criticism of others in the slightest degree, but solely for the purpose of protecting ourselves. We cast no aspersions on any race or creed, but we must remember that every object of our institutions of society and government will fail unless America be kept American.” Some, succumbing to emotion, hear racism and “white supremacy” in such remarks. They completely misunderstand Coolidge. He reminds us that by upholding certain rules, everyone is protected and those with no regard for law will be prevented from bringing harm, economic and otherwise, to those who respect the rights of others. If a person enters in disregard of the law, on what basis will he or she respect the laws that protect those already here? If laws are arbitrarily applied or selectively enforced, it tells the law-abiding there is no protection under law at all. The law has become the preferences of those in power, instead of an impartial rule fairly obligating everyone alike and observed for the good of society. When that happens, no law is strong enough to hold back the consequences. This is why Coolidge defended the wisdom of an incremental, legal immigration. He did so in order to ensure people are not forced to bear more than can be borne to care for and help assimilate those who come here to become Americans. The exercise, at times, of a nation’s right to deport becomes just as essential when individuals come here to reject assimilation, break the law and make trouble, as both Marcus Garvey and Lothar Witzke did. Such is felt to be unfeeling and devoid of compassion today. What is really missing is today’s lack of concern for the costs of policies passed while haste in implementing legislation on emotion alone prevails. How many people have been hurt by the good intentions of feeling rather than thinking through our nation’s challenges? Electoral politics cannot be the impetus for crafting future immigration law. 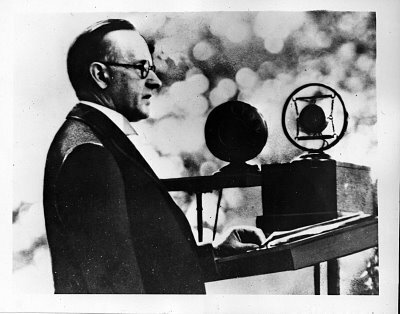 As Coolidge observed, “As a nation, our first duty must be to those who are already our inhabitants, whether native or immigrants.” Of course, Coolidge meant legal immigrants. He did not indulge in the politically correct game with which we now call illegal inhabitants, “undocumented workers.” It is a hard truth to digest but no less necessary if we are to retain freedom with responsibility. 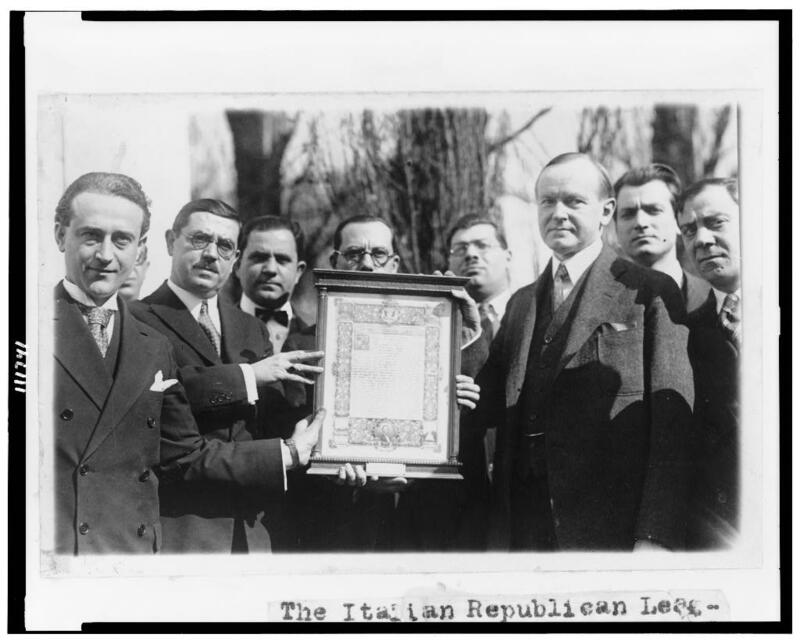 The Italian Republican League of New York presents President Coolidge with an original parchment of the Gettysburg Address, February 12, 1927 (Library of Congress photo).